Student Voices is a platform to engage youth in key issue areas and bolster their involvement in Social Youth Justice. Student Voices connects Students to Power. The target population is elementary, middle, and high-school students. The youth targeted for a Student Voices experience are students who are or will be directly affected by a decision/s Elected Officials, Policy Makers, and other leaders in their sphere of influence are or will be making. Youth targeted for Student Voices have been selected by Impact Sac, their school, an organization, or law enforcement to participate. Their institutionalized knowledge of the effects of certain decisions will inform key leaders and can become the guiding influence in solutions for ending it. 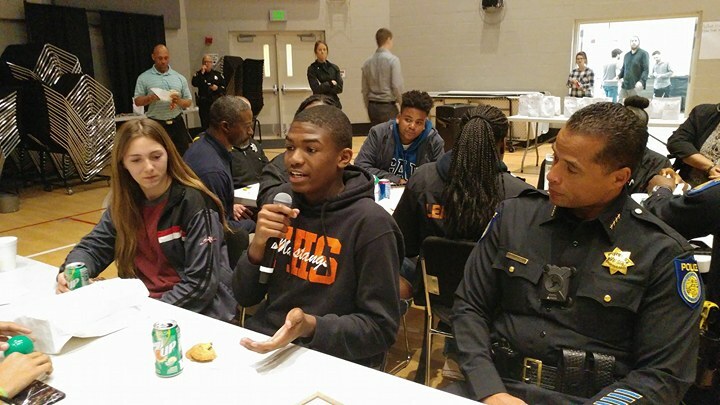 Student Voices allows elected officials, law enforcement, educators, and other key leaders an opportunity to be informed by youth on solutions to end or improve negative situations. We provide meet and greet, panel discussion, lunch, photo ops, and more. Youth hear from elected and appointed positions and have opportunities to make suggestions or ask questions. Moderators thoughtfully guide discussions to ensure the work advances and that Influential Listeners are given equal opportunity to hear from youth. This program is made possible through collaborative effort of Twin Rivers School District, Liberty Towers Church, Crime Pays, Sacramento City Police Department, Sacramento Sheriff’s Department, Sacramento County District Attorney’s Office, Sacramento County Public Defender’s Office, Judge Steven Bailey, and others. We have worked hard to ensure that Student Voices 2018 lifts the voices of students by collaborating to provide a powerful platform of influential listeners who care. We are excited to share information about 2019 Student Voices Influential Listeners within the coming weeks! "Liberty Towers hopes to ensure that students feel that their voices are heard and that they have a seat at the community table. Influential Listeners should feel informed by student voices. This will improve relationships with youth and the justice system. Student Voices is the start of an inclusive conversation about safety in the community and in our schools."